While the digital world turns without the funeral industry, a funeral director in Melbourne decide it’s time to adopt a proactive approach in funeral planning with the Memory Maker app. 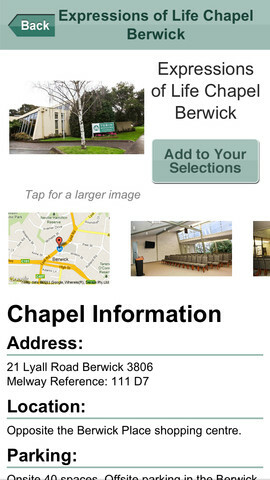 Memory Maker (available for iOS and Android coming soon) gives the user a funeral planner at their fingertips. A world first, this app has certainly given Tobin Brothers Funerals the kind of edge that, at the moment, can¹t be matched by the other industry bodies. With an emphasis on celebrating lives’ and an approach geared towards future generations, Memory Maker is more than fitting for Tobin Brothers’ next phase. So how does it work? It’s essentially a digital catalogue. Browse through various products and services ­ coffins, flowers, cards, etc ­ and make your selections. What sets it even further apart is that the app includes prices. Ease of use, transparency and convenience. The kind of practicality needed during a difficult time in someone¹s life. A real game changer. Bizarre? Impersonal? Neither. Just new. With the number of tablet sales in Australia sky-rocketing in 2012 and more smartphones than people, this app is responding to a trend that can’t be ignored. Those making decisions about their loved one’s send off, or their own, can now do so in the comfort of their own surroundings. This doesn’t mean Tobin Brothers’ funeral directors have become obsolete; staff are equipped with Memory Maker for iPad and continue to provide their face-to-face, personal service. In light of there being over 30 million accounts on Facebook belonging to the dearly departed, it’s a natural progression that people are giving more thought to their digital legacy. With that being said, Memory Maker is the first phase of Thinktank Social’s digital partnership with Tobin Brothers Funerals. Big plans for social media are in the making for 2013 and you can expect that Tobin Brothers Funerals will continue to be at the top of the industry. This is the tip of the iceberg for this forward-thinking brand ­definitely one to watch! Want to know more about this app? Check out the Tobin Brothers website.